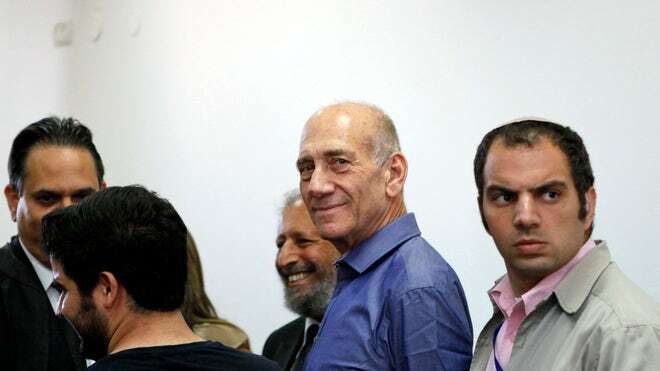 On trial for the last two years, Olmert was accused of allegedly paying for family vacations by double billing Jewish organizations through the Rishon Tours travel agency; allegedly accepting envelopes full of cash from American businessman Morris Talansky; and allegedly granting personal favors to attorney Uri Messer when he served as trade minister in the Investment Center case. The charges were filed after he became prime minister in 2006, but covered his time as mayor of Jerusalem and later as a government minister. However, at the same time, Pennsylvania Corbett has decided to award a $249,660 contract to the Republican lobbying group, Bravo Group, to “educate” Pennsylvanians about the Commonwealth controversial, restrictive, new voter ID law. The Bravo Group is the work of Republican lobbyist Chris Bravacos who used to be the Executive Director of the Pennsylvania Republican party. Bravacos has personally donated $27,400 to the Romney campaign. Corbett defends the Voter ID law on the hollow pretense that it prevents voter fraud, but when Corbett was Pennsylvania Attorney General he did not pursue a single case of voter fraud. Imagine what the conservative uproar would be if President Obama were to award a federal grant to MoveOn.org to advocate for the Affordable Care Act (“Obamacare”). Under the proposed law, concealed handgun licenses would be acceptable forms of photo ID, but student IDs would not. Many of those without IDs would have to travel great distances to get them, and some would struggle to pay for the documents they might need to obtain them. We call those poll taxes. Isn’t paying a conservative lobbyist to advocate for a Republican voter supression effort the very definition of double billing? Sample ads pulled from the Bravo Group’s vimeo channel follow the jump. Dramatic music over pictures, including one of three suffragettes. Video of overly happy people showing a card that is supposed to resemble an ID. Also confuses the issue by saying “other kind of photo id” will be accepted, without explaining what that means. 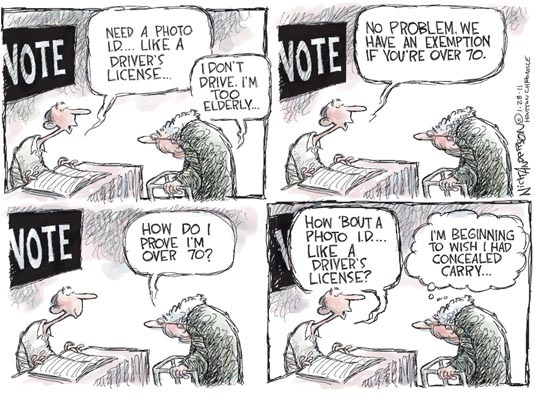 As the Republicans keep up the pressure to deny suffrage to the young, the elderly, the poor and minorities, keep in mind that you don’t need ID to vote in the Iowa Republican caucuses. You just need a registered Republican to vouch for you. You can show up, declare that you want to participate, and then participate. Remember, states control voting laws for their states, and primaries and caucuses are designed by the party in each state. If you’re still wavering on the question of racism in the GOP, this should be your final impetus to understand that to be a Republican is to be a racist.